The Guardian newspaper has reported that the ministry of education of Saudi Arabia will allow private girl schools to offer sports activities. CNN tells us the tale of the first woman lawyer of the country. Women have been allowed to study law since 2005, so it’s about time the first woman also actually becomes active as a lawyer. The message of the image of the social campaign might be missed if you just gloss over it, but a proper look shows how powerful it is. 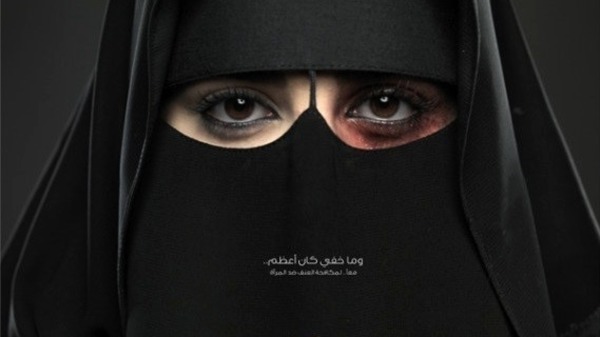 It’s part of a nation wide “No More Abuse” campaign by the King Khalid Foundation. Yes, this is tiny progress, but progress nonetheless. So Saudi Arabian ladies, here’s a salute from the original British Tamil Bad Girl M.I.A.